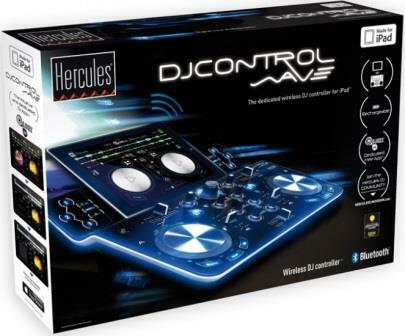 The Hercules DJControlWave sleek, wave-shaped design with Bluetooth connectivity and rechargeable battery gives DJs complete freedom to mix and rock parties anywhere as there’s no need for any kind of cable between the controller and the iPad®: the Bluetooth® connection is instant and the control is totally wireless. When mixing at a party, the DJ is even free to take the iPad® onto the dance floor, away from the controller, without ever losing control of the mix! The Hercules DJControlWave’s range is up to 10 meters. The built-in rechargeable battery is also a huge plus in terms of freedom of movement: say goodbye to the days when a DJ always had to keep the controller connected to a power source. Battery life even allows for a whole night of non-stop mixing (up to 8 hours)! Extremely lightweight and showcasing an elegant look, the innovative design of the Hercules DJControlWave ripples like a wave, and is perfectly crafted to support the DJ’s iPad®. The iPad®’s angle of support can be adjusted in order to adapt to different DJing positions and styles. All controls are intuitive and ergonomic, including the two jog wheels, two pitch sliders, buttons for effects, samples and cue points, and rotary encoders for EQ settings. Even the controller’s backlighting, which adds to its futuristic look, has been designed to be both attractive and helpful: it guides the DJ, even in low-light conditions. The DJUCED™ DJW app has been specially designed for the Hercules DJControlWave, and was developed to function in perfect harmony with the controller (the app is available for free on the App Store). The app is incredibly simple both to learn and to use to create great mixes, even for those just starting out as DJs. Although this new controller has been designed for the iPad® (its “Made for iPad” certification is pending), it is also compatible with both Mac® and PC, via a USB connection and the included DJUCED™ 40° software. The Hercules DJControlWave also comes bundled with a super-convenient splitter cable – allowing users to connect both speakers and headphones to privately preview upcoming tracks. •The Control Wave is a wireless DJ controller designed for the IPad. •It has built in Bluetooth 3.0 wireless technology with ultra-fast connection. •Just pair and mix: intuitive DJ-ing right at your fingertips. •The control surface features 2 separate decks. •The Control Wave is a slim design, features a glossy black top panel, and metal plating on jog wheel tops. 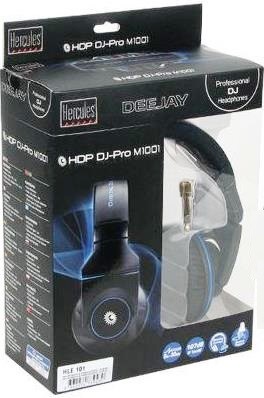 The Hercules HDP DJ-Pro M1001 Professional DJ headphones with style and comfort are a pair of closed-back circumaural also called full size headphones that feature 50mm drivers and a frequency response range of 5Hz-30kHz. 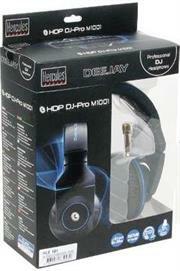 Their design is distinguished by the matte black finish and blue detailing on top of the ear-cups and headband. For extended wear the headphones have a wide adjustable headband. The closed back ear-cups have leather cushioned ear-pads that form a barrier over the ear. The ear-pads cover the ear for audio isolation and seal the ear to prevent sound leakage. Both ear-cups pivot from three different axes; they rotate 180 degrees and twist horizontally 90 degrees so that you can swivel them for single ear-cup monitoring. 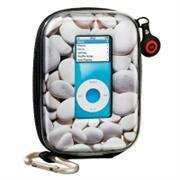 In addition, the headphones fold flat so you can store them in the provided carry bag. The ambidextrous coiled cable can detach and be connected to the left or right ear-cup. A 1/4"/6.35 mm stereo jack adapter gold plated adapter is also included which screws on to the 1/8"/3.5 mm stereo mini-jack plug connector at the end of the cable. This adapter allows you to connect to audio devices that have a 1/4"/6.35 mm such as mixers, controllers, amps and more. 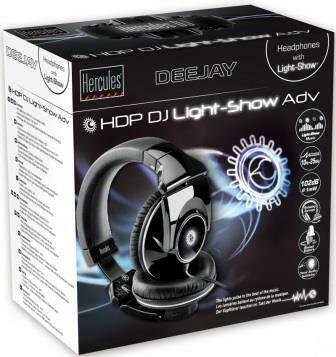 The Hercules HDP DJ Light-Show ADV Professional DJ Headphones are designed for DJ monitoring in live performance applications. 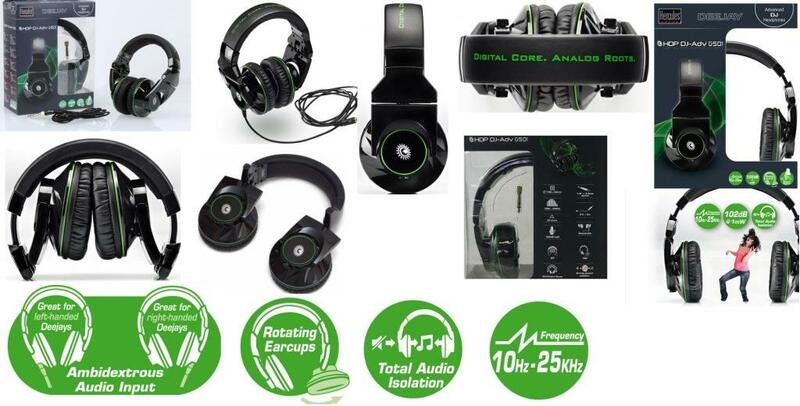 The closed-back circumaural headphones (also called full size headphones) headphones (sometimes called full size headphones) utilize 50mm drivers to deliver a frequency response of 10 to 25,000 Hz with a sensitivity of 102 dB per 1 mW. For DJing, the ear cups can rotate 180° vertically for one ear monitoring, 90° horizontally for wearing the headphones around the neck, and 90° inward to fold for easy transport. The headphones feature an illuminated logo that pulses with the beat of the music. A USB to USB Micro cable is included for recharging the headphone's built-in battery. The headphones also come with a 2metre straight headphone cable and an 3.5 mm stereo mini-jack plug to 6.35 mm stereo headphone adapter for connecting to a variety of sources. 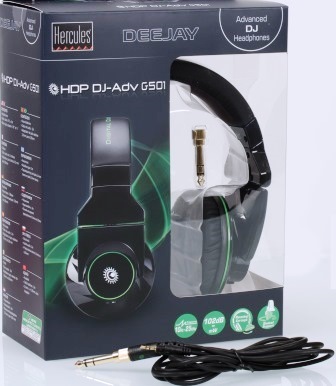 The Hercules HDP DJ-Advanced G501 are a pair of closed-back circumaural headphones that feature 50mm drivers and a frequency response range of 10Hz - 25kHz. Their design is distinguished by the matte black finish and green detailing on top of the ear-cups and headband. The headphones have a wide adjustable headband that fits over the head for extended wear. The closed back ear-cups have leather cushioned ear-pads that form a barrier over the ear. The ear-pads cover the ear for audio isolation and seal the ear to prevent sound leakage. Both ear-cups pivot from three different axes; they rotate 180 degrees and twist horizontally 90 degrees so that you can swivel them for single-ear monitoring. Hercules, the expert audio solutions designer, is excited to unveil the new speakers range for its Wireless Audio Experience (WAE*) product line. To satisfy even more unique tastes and expectations of music enthusiasts, these speakers boast incredible portability, battery life, interconnectivity and sound. Driven by Hercules' passion for music, the new BTP03 Mini speakers were designed to reach listeners of all kinds whether they enjoy music via a computer, smartphone or tablet. By taking listening to the next level, the new speakers allow listeners to enjoy the power and emotion of music almost everywhere they go. 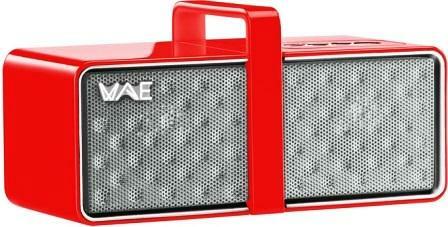 Designed with more than 30 years of audio and wireless innovation experience, these WAE speakers are remarkably crafted with the listener's needs in mind -- whether users are looking for superb acoustics, a speaker for more on-the-go use, or the perfect solution for listening to all of the music stored on a smartphone. At barely over 165mm wide and weighing 320g listeners will be amazed by the battery life and audio clarity of such a small sound system. This new super-compact Bluetooth 2.0 speaker is easy to slip into a purse or bag, allowing users to take it anywhere and wirelessly stream music and audio stored on a smartphone or tablet. The BTP03 Mini boasts 14 hours of battery life (at 80 percent volume), so users can enjoy listening to their favourite tunes all day long. 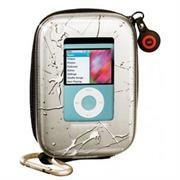 The BTP03 Mini features two active drivers and dual bass reflex ports, providing clear sound. Thanks to a built-in microphone, the Hercules BTP03 Mini include a hands-free, easy-to-use calling function. Connecting the speaker to a hi-fi system (using a mini-jack cable) turns the speaker into a Bluetooth receiver that lets users stream music from their smartphone or tablet.Bluetooth A2DP multipoint technology lets users connect two phones at the same time: it takes just a few seconds to switch from one phone to the other (depending on the phones' connection time). Hercules also developed the "WAE Remote" -- an extremely easy-to-use app that's compatible with both iOS (4.0 and higher) and Android™ (2.2 and higher), providing listeners with another very convenient way to use the speaker. The WAE App helps manage Hercules speakers equipped with Bluetooth technology, and turns users' wireless music experience into a simple moment of pleasure. Intuitive, user-friendly and rich with ingenious features, the application is compatible with iOS (4.0 and above) and Android (2.2 and above). The WAE App allows users to easily control the speaker's volume and effects, , and to adjust the equalizer's settings to perfect tone.